One usage is to show how Requirements are connected together in a hierarchy but a more compelling usage is to show how requirements are connected to other elements. 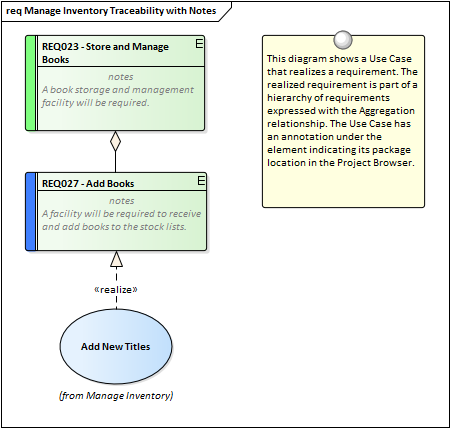 The experienced modeler will define and manage the requirements in the Specification Manager and then use the requirements diagram to show how one or more requirements are related to up-process elements such as Business Drivers and down-process elements such as Use Cases, User Stories, User Experience designs and solution Components. The appearance of a diagram can be changed to suit the audience, and details can be included, suppressed or altered to ensure the diagram meets its main objective of communication. 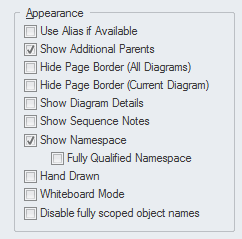 There is a wide range of options ranging from creating a Hand Drawn style of diagram to page setup.